SBI PO 2019 – State Bank of India (SBI) has released the notification for SBI PO 2019 Recruitment at sbi.co.in on April 02, 2019. The SBI is inviting the online application form from the interested and eligible candidates from April 02 to 22, 2019. The graduates and postgraduates of 21 to 30 years can apply by submitting the registration fee of Rs 750/- (If unreserved) and Rs. 125/- (if reserved category candidate). The selection of 2000 Probationary Officer will be done by conducting the Prelims, Main and Interview. The online prelims exam will be held on June 08, 09, 15, 16, 2019 and Online Main examination is scheduled to be held on July 20, 2019. 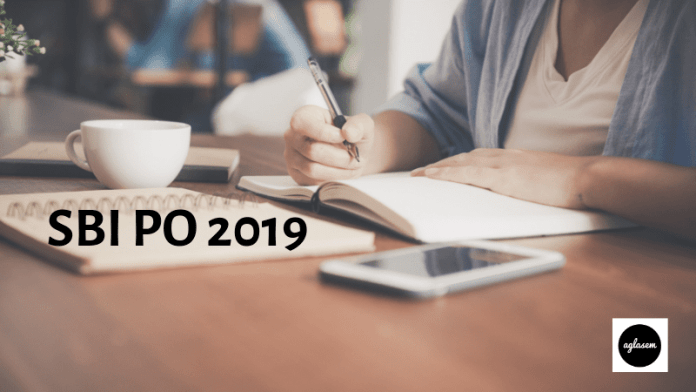 Get here all the details of SBI PO 2019. Latest: The application process of SBI PO 2019 has been started. Scroll down to apply. SBI introduced 2000 vacancies for this recruitment, in which 53 are backlog vacancies. The candidates can apply before the deadline. There will be pre-examination training for the reserved category candidates without any fee. This page consists of each and every information associated with SBI PO 2019 recruitment process. The application form of SBI PO is available on the official website of SBI. The candidates can apply form below. The direct link for the application form is given here. But the candidates have to ensure about the eligibility beforehand. Only eligible candidate should apply. Apply Online: Click here to fill the online application form of SBI PO 2019. For doing the successful registration the candidate should submit the application fee. The application fee differs for each category. Rs. 750/- is an application fee for the candidates of Unreserved Category. Rs. 125/- is an application fee for the candidates of Reserved category. The candidates can pay the requisite amount through online mode by using debit card/ credit card/ Internet Banking. Through this recruitment, SBI will recruit 2000 candidates for the post of PO. Here the backlog vacancies are also carried forward. The candidates can check the category wise vacancies from here. Ensuring eligibility is the prerequisite of recruitment. The candidates have to ensure eligibility before applying for recruitment. The candidates who meet eligibility criteria laid down by the Bank can apply successfully. Age Limit: The candidates of age bracket of 21 to 30 years can apply. Educational Qualification: The candidates must have a graduation degree in any discipline, the candidates who are in the final year also eligible, but they have to produce the marksheet before the interview. A number of Permissible Attempts: The Bank has restricted the number of attempts for SBI PO 2019. The category matters here as well. For General/ EWS category 4 attempts are permissible. For General/ EWS (PWD) / OBC / OBC (PWD) category 7 attempts are permissible. For SC/ SC (PWD)/ ST/ ST (PWD) no Restriction on attempts. The Bank will conduct the Pre – Examination Training for the reserved category candidates. For availing this facility the candidates belonging to the special categories have to fill the relevant column in the application form. Though the bank is providing this training in free of cost, however, the transportation charges have to be borne by the candidate itself. Such candidates will be issued the call letter for the PET. The candidates who will fill the application form along with the requisite amount if a fee in time, Bank will issue them the call letter for Preliminray examination. The admit card will be issued at the sbi.co.in. The candidates who will have inlisted their names will be able to download their admit card by entering the registration number/roll number and date of birth/password. Later the qualiferis of the preloms will be issued the call letter for the main examination. Each time the mode of fetching the admit card will be online. At last, the qualifiers of Prelims and Main exam will be issued the admit card of interview and group exercise. Carry the admit card along with the valid photo identity proof in each stage of the examination will be compulsory to gain the entry in the exam hall. As we discussed above the selection of the candidate is dependent on three stages: Prelims, Main and Interview. Here we will elaborate on each stage thoroughly. Marking Scheme: 01 marks will be awarded for the correct answer, and 1/4 will be deducted for an incorrect answer. Stage II consists of two papers one is objective in nature and another is descriptive in nature. The duration of this test will be 30 minutes. The candidates will have to write an essay and a letter in English. Both questions will be 50 marks. The main objective to conduct this test to measure the comprehension skill of a candidate. The interview and Group Exercise will be the last step in recruitment. The Bank will call candidates numbering up to 3 times of the category wise vacancies for the Group Exercise & Interview. The Bank will arrange the BioMetric verification on a different stage of examination. In the verification, the bank will capture the photograph and thumb impression of the candidate in digital format. For the proper capture of thumb impression the candidate should follow these instructions. The candidate should ensure that his/ her correct thumb impression should be captured in each stage of examination. The index finger will be captured while the verification. To ensure the correct fingerprint, the candidates are advised not to apply any matter like Mehandi, ink, chemical etc on their hands. In case, if any candidate is found not to be genuine, then apart from taking legal actions against him/ her, his/ her/ their candidature will be cancelled. The Bank has chosen a total of 33 states and union territories for the conduct of the examination. The candidates have to choose the examination city while doing the registration. 42 Uttar Pradesh Agra, Aligarh, Allahabad, Bareilly, Banda, Faizabad, Ghaziabad, Gonda, Gorakhpur, Jhansi, Kanpur, Lucknow, Mathura, Meerut, Moradabad, Muzaffarnagar, Noida/ Greater Noida, Sitapur, Varanasi. Likewise, admit card of SBI PO, the result will be declared thrice, for Prelims, Mains and interview. The prelims exam will be qualifying in nature. The marks will be obtained in the prelims will not be added in the final merit list. The result of prelims will be declared at sbi.co.in after the successful conduct of the examination. The candidates who will have appeared in the examination will be able to check their result by entering the registration number/roll number and date of the birth/password. The same procedure will be adopted for declaring the main exam result and the final result. After the final selection, the SBI will provide the basic salary Rs. 27,620/- (with 4 advance increments). The pay scale of the candidates will be of 23700-980/7-30560-1145/2-32850-1310/7-42020 applicable to Junior Management Grade Scale-I. Apart from the basic salary, the candidates will be provided the Dearness Allowances, and House Rent Allowances, Lease rental, C.C.A, Medical, and other allowances & perquisites. The total compensation per annum on CTC basis be a minimum of 8.20 lacs and maximum of 13.08 lacs depending on the place of posting and other factors. Initially, after the selection as Probationary Officer, the candidates will be provided an online training, for giving the basic knowledge of banking. The candidates who will be selected finally will have to execute a Bond of 2.00 lac ( Two lac only) to serve the Bank for a minimum period of three years. The Bond will be invoked by the Bank if any candidate resigns before the completion of the bond period. The probation period will be of 02 years, the candidates have to serve this period and have to prove himself /herself. As due to unsatisfactory performance the service of the candidate can be terminated by the bank. For more information download the advertisement of SBI PO 2019 from here.